Today, we're going to talk about the basics of localizing (creating versions in multiple languages) a PHP site using the Gettext extension. In theory, the steps are pretty simple. Create translation tables for each additional language. There's a one-to-one correspondence in the translation tables so "This is my string" will be mapped to a different string in each language. Setup which language your site is using at any given time. In practice, it's a little more confusing than that. The PO (.po) file. This is a plain text file which contains some project & charset info, then a list of PHP files, the strings in those files, and the translations of those strings. The MO (.mo) file. This is a binary file that is essentially a "compiled" version of the PO file. This is the file that actually gets read by PHP to figure out which string to display. 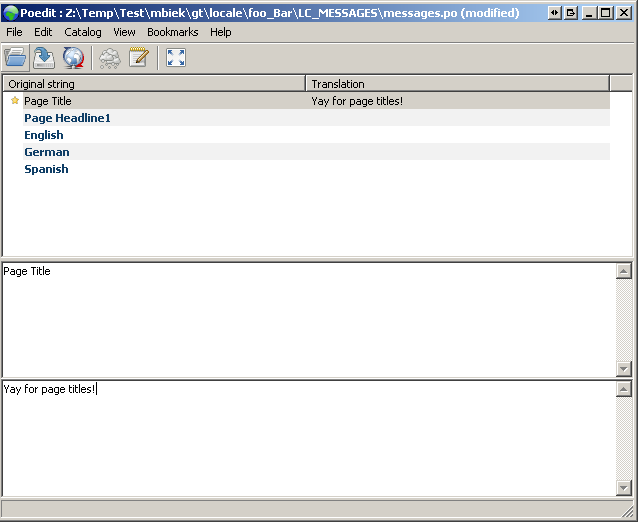 It's possible to create the PO and MO files using the xgettext and msgfmt command-line tools. However there's a very nice GUI app called POEdit which runs on Windows, Linux, and OSX. It's free and makes working with these files much easier so that's the method I'm going to cover. The first thing you want to do is create an area for your locale files to be stored. I recommend something like the following where folders are named according to their standard locale names. In fact, on Ubuntu, this didn't work unless the name of folder containing the PO and MO files exactly matched the locale name listed in /etc/locale.aliases (minus the charset info). On Ubuntu, you may have to install the language packs for the languages you're going to be using. 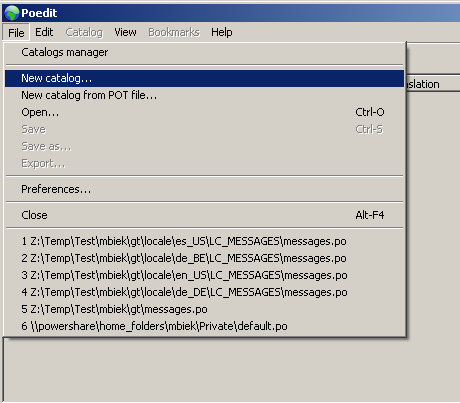 Now fire up POEdit and create a new catalog. Enter some relevant information about your project. The most important things here are the language and country this translation is going to be for. Set the Base path to the directory where your PHP files live, then add "." to the list of paths to scan for files. 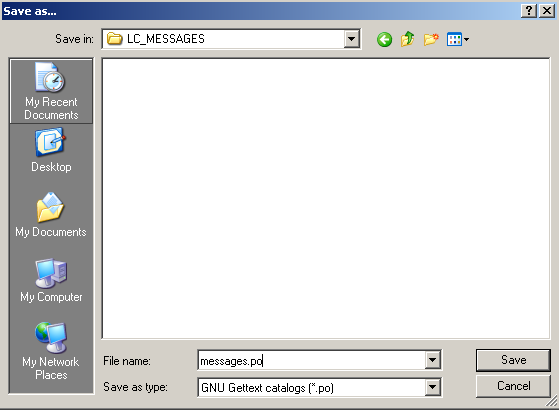 Then save the file as messages.po (you'll see why the name is important down the road) to the LC_MESSAGES directory you created for this particular language. Now click the "Update Catalog" button to tell POEdit to scan your PHP files for strings wrapped in gettext(), _(), or any other functions you may have added to the Keywords section of the project settings. 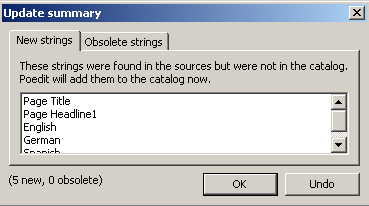 This will display a list of strings that will be added to the PO file. Once the strings have been loaded, it's simply a matter of entering the translations and saving to generate the MO file. There are several things happening here. 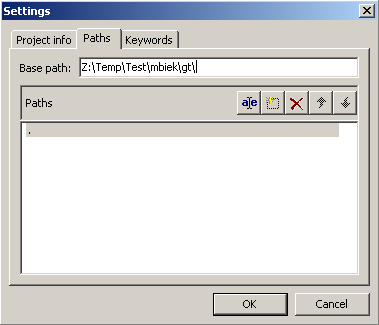 First we check to see if the locale is specified as the query string. If not, we default to English. Then we specify the path to the locale directory and set up the translation "domain" ($domain = 'messages'; tells PHP to look for MO files named messages.po). As long as "Page Title" exists in the translation table, the translated string should be output instead of "Page Title". For simple cases where English is the default, I think it's reasonable to just put the English text in the _("") call (like _("Welcome to my page!")). In the product case where I'm going to be using this, there's going to be a huge amount of content in big chunks so I opted to treat each string as a named indentifier (like _("Page TItle")) and then create a translation table for english. You need to restart Apache anytime your PO and MO files change. This because gettext caches the translation tables and won't reload them without a webserver restart. Ubuntu needed to have language-packs installed for each language I implemented.